Video production is an art, just like filming and directing, and until a few years, superior production gears and exceptional editing skills were required to produce a polished video. Today’s technological advancements and low cost manufacturing techniques have given birth to affordable cameras and smart phones that can capture ultra HD videos. It is quiet easy to shoot hours of video with them, but to make a fantastic movie out of your raw footages, you need a brilliant video editor. Now it is not difficult to find video editor tools both free and paid, but to make every work a masterpiece, you definitely need the best one. The CyberLink PowerDirector 15 Ultra is certainly one of the best in the market and it will let you explore your creativity to its best and showcase it in your creations. Check all Cyberlink Coupon Codes and Discounts. Let’s have a closer look at its features and performance. The PowerDirector 15 Ultra boasts a number of very distinctive and highly customizable design tools to take your creativity to an entirely new level. Let us have a look at a few of them here. Mask Designer and Blending Effect: It allows you to create exciting special effects by fusing texts and images together. With The Mask Designer, you can mask images and texts and apply different transparency levels to the contents for an enhanced visual experience. 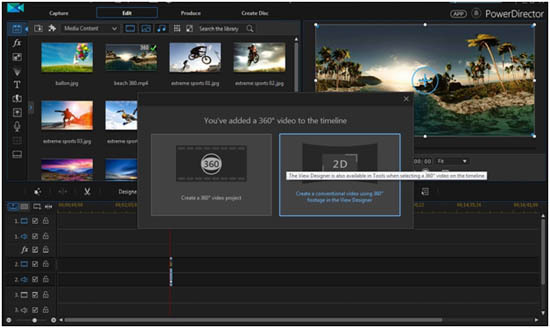 The Blending Effect tool can be used to merge different clips in the timeline tracks and to blend a texture to the video for en eye-catching special effects. Title Designer: The title designer provides you absolute freedom to design animated titles that perfectly match your taste. It offers more than 120 video effects so that your titles look really unique and highly professional. Theme Designer: It is a perfect tool to make amazing 3D animated video slideshows with your video clips and images. Motion Tracking: This is a very useful tool while making videos of sports events or action sports. This feature enable you to track moving path of multiple objects or persons in the video and allow you to attach name or sport light effect in order to highlight that particular object. MultiCam Designer: Shooting with multi-cams is quite common these days, but editing and synchronizing these footages can be messy. However, it is no more an issue as the MultiCam Designer can make it pretty simple. It can also synchronize multiple footages on the timeline with the new Sync by Audio feature. Action videos are the most difficult to produce but with the PowerDirector 15, it is no more a herculean task. The Action Camera Center in the new version incorporates the most useful tools for editing action videos. You can stabilize shaky footage, correct fish-eye distortion, and easily apply special effects such as slow motion, freeze etc to any part of the movie instantly. It is also easy to correct chromatic errors in footages captured in snow and underwater using the Action Camera Center. This is a new feature added to the PowerDirector 15. Now you can shoot your favorite scenes even at unfavorable weather and light conditions. Color enhancement tool will analyze the footage and optimize the hue and vibrancy intelligently and convert any dull footages into amazing videos with true-to-life colors. Nowadays, smartphone are widely used to record videos and most of the videos shot are in vertical 9:16 aspect ratio. 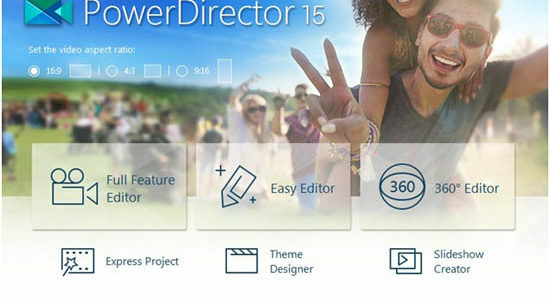 The PowerDirector 15 offers seamless support to the vertical 9:16 video formats. Now you can edit, add titles, effects, and PiP objects to vertical videos can be uploaded to YouTube, Vimeo, Facebook and many other social media websites. It is a high power 64-bit video rendering engine incorporated in the new version. It can make previewing and production substantially faster compared to any other video editing software available today. PowerDirector 15 supports all popular and high-end audio-video formats and codec, including FHD, 4K UHD, XAVC-S, AVCHD 3D/Progressive and H.265. PowerDirector 15 allows you to import slow motion video clips with frame rates 120/240 fps, shot using iPhone or any other action sports cameras and work on them very easily. You can edit and add special effects, titles etc using the Action Camera Center and preview them inside the editor. The hardware acceleration technique will let you render and produce high frame rate videos amazingly fast. In addition, the OpenCL acceleration on effects improves rendering and previewing speeds, and optimizes the onboard and external graphics card performance to a great extend.